Magic: Puzzle Quest 3.2 Update is Here! - D3 Go! MAGIC: PUZZLE QUEST 3.2 UPDATE IS HERE! We’ve got plenty of new content coming your way in the 3.2 build: new features, new updates, a new Planeswalker, a new event, and plenty of bug fixes! Check out all the details below. First off, for those of you that haven’t read the Magic: the Gathering – Puzzle Quest – 3 Year Anniversary blog post, then what are you waiting for! There’s some awesome info about from the development team that you don’t want to miss out on, including the initial announcement of Player Profile. For those of you that have already read it, it’s time for Player Profile to arrive in 3.2! Now you can track your progress, show off your best decks, and even receive special rewards based on your level! As a new player, getting used to all the different cards and effects MTGPQ has to offer can be…daunting at first. Conversely, veteran players spend enough time piecing together intricate decks and deliberating cunning strategies that they already know practically every card detail and effect like the back of their hand. This is where the Card Visual Aid comes in. The new Card Visual Aid setting allows for players to enjoy MtGPQ the way that best suits them, and seeks to improve the player experience when casting cards and triggering effects. Need more time to read and understand each card and effect when they occur? Not a problem! Think too much time is spent watching cards and effects pop up, instead of playing? We’ve got you covered too! “Disillusioned by his servitude to Nicol Bolas, Sarkhan fell into madness. However, a voice in his mind led him to the spot where the Spirit Dragon, Ugin, died. Level 1 – Draw a card, then increase one of your colored mana bonuses by 1 (chosen randomly) until end of turn. Level 2 – …increase your mana bonuses on each of that card’s colors by 1 until end of turn. Level 3 – …by 2 until end of turn. Level 4 – …by 2 for 3 turns. Level 1 – Create a Minor Tarkir Dragon Token. Level 2 – Create a Tarkir Dragon Token. Level 3 – Create a Major Tarkir Dragon Token. Level 4 – Create a Major Tarkir Dragon Token. Create a Temur’s Hunger Token. Level 1 – Fetch the next creature with power 6 or greater from your library and give it full mana. Level 4 – …full mana. Then, all creatures in your hand gain Haste. Minor – [Red, Green] Creature – Dragon: 1/1 Flying – When this creature enters the battlefield, it gets +X/+X, where X is your Red mana bonus. Minor – …where X is the sum of your Green and Red mana bonus. 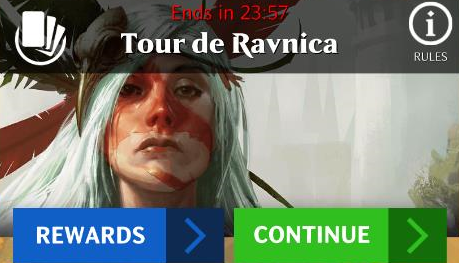 Major – …sum of your Blue, Green and Red mana bonus. [Blue, Red, Green] Support – 3 Shield – Whenever a creature you control attacks, if that creature’s power is 6 or greater, it gets +1/+1 and Trample until end of turn. We’ve added Expert and Master decks to the Planeswalkers that were missing them. Play around with their new decks to see if you can figure out the strategy with each one! Want to get a head start on building the perfect deck for Sarkhan Unbroken? Maybe you just need those last few cards to complete the new Expert/Master decks. There will be a brand new selection of special offers available in 3.2, so keep an eye out in the Vault, so you can snag them while you can! Overload (Blue, Red) – Whenever a player casts a spell, for each spell in their graveyard, the opponent’s Planeswalker takes 1 damage. Battalion (White, Red) – At the beginning of each player’s turn, if that player controls three or more creatures, those creatures gain Double Strike and +2/+0 until end of turn. Populate (White, Green) – When a creature token you control enters the battlefield, it is Reinforced. When a non-token creature you control enters the battlefield, that creature gets +1/+1. Cipher (Blue, Black) – Whenever a player casts a non-copy spell, if they control a creature, create a copy of that spell. It gains mana equal to that player’s first creature’s toughness. Scavenge (Black, Green) – Whenever a creature dies, the first opposing creature gets +X/+X, where X is the destroyed creature’s power. Training Grounds. It’s a great event to test out new decks or strategy, but it can be a hassle waiting for the specific event format you want to appear. Not anymore! 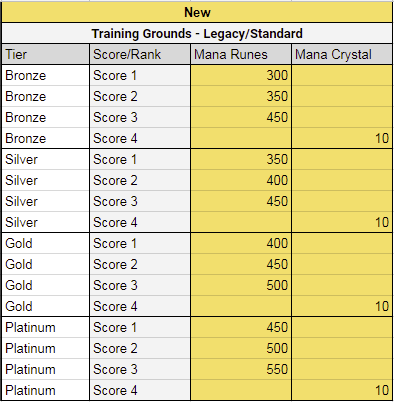 Starting in 3.2, both Legacy and Standard Training Grounds events will be scheduled daily! In order to avoid potential server issues from both events starting and ending at the same time, the duration of each event has been reduced from 24hrs to 22hrs. The specific button to rearrange the cards in the player’s hand is no longer missing. An infinite loop no longer occurs when casting a Support that buffs a Creature after summoning at least two Creatures with Vigilance, while the opponent controls a Support that Disables the first Creature the player controls. The player’s Planeswalker now retains ‘Prevent Damage’ when one Lich’s Mastery Support gem is destroyed while there are multiple Lich’s Mastery Support gems on the board. Kraul Harpooner’s ability no longer remains inactive when casting Kraul Harpooner while there are zero Creatures in the player’s graveyard. Part of the card destruction animation no longer displays in the middle of the screen when summoning a non-Angel token while Divine Visitation is on the board. A near-infinite loop no longer occurs when casting Blue Sun’s Zenith with both Stitch in Time and Expansion//Explosion in the deck while Blue Sun’s Zenith is the first card in the player’s Graveyard. Players now draw a card, instead of fetching the top card of their deck, when one of the player’s Djinn’s Wish Support token is destroyed. The player’s first Creature is now given to the opponent, instead of being destroyed, when casting Switcheroo while the opponent controls three Creatures on the battlefield. Gems are no longer converted to the opponent’s Planeswalker’s colors when beginning the turn while Primal Wellspring was on the board. Vigilant Angel tokens now receive Trostani Discordant’s buff when Trostani Discordant enters the battlefield while there are no Vigilant Angel tokens on the battlefield with Divine Visitation on the board. An extra non-Angel Creature Token is no longer created when creating one or more non-Angel Creature Tokens while Divine Visitation and Anointed Procession are on the board. An infinite loop no longer occurs when summoning a Zombie Token while Divine Visitation and Open the Graves are on the Board and Graveyard Marshal is on the Battlefield. The Creature in the player’s first position is now given to the opponent, instead of reinforcing, when casting Switcheroo while both players have the same Creature in the first position. An opponent’s Creature with five or less Toughness will no longer remain on the battlefield when casting Warping Wail while there are six or more Void gems on the board. Opponents are no longer able to cast Spell cards until the beginning of the player’s next turn when the opponent draws a Spell card after Azor, the Lawbringer enters the player’s battlefield on the previous turn. Soul-Scar Mage’s ability no longer remains inactive when casting a Spell while the opponent controls no Creatures. Squee, the Immortal is now considered summoned when Squee, the Immortal returns to the battlefield after being destroyed. Grunn, the Lonely King’s ability now activates when attacking while the player controls no other Creatures and Grunn, the Lonely King has one or more reinforcements. Mirror Image is no longer an invalid target to copy when Mirror Image enters the battlefield. The Haste Evergreen is no longer missing when a Colorless Token Creature is created by a Creature’s effect while Forerunner of Slaughter is on the battlefield. If the player doesn’t have any creatures on the battlefield when the AI uses Beacon Bolt, it will now target the player’s Planeswalker, instead of itself. The additional buff is no longer missing when reinforcing Venerated Loxodon. District Guide now activates when it is summoned from outside the player’s hand. Naru Meha, Master Wizard’s effect now activates when Naru Meha, Master Wizard enters the battlefield from anywhere other than the player’s hand. If the player’s hand is full, then Radical Idea will no longer be able to be cast from the player’s graveyard if it had full mana. Resplendent Angel is now destroyed, instead of being reinforced, when Resplendent Angel’s toughness is reduced to zero after blocking an opponent’s Creature while Resplendent Angel has Lifelink. Forest Tokens will now appear when casting a creature with Leader, while it was affected by Nissa, Worldwaker’s Worldwake ability, and while there is at least one token of the creature’s Leader type on the battlefield. Creatures with the Prevent Damage Evergreen are now destroyed when casting Tragic Arrogance. The Pacifist objective now only tracks when the player destroys an opponent’s Creatures. Players no longer only receive Agrus Kos, Wojek Veteran, instead of the Guild-specific exclusive card, when earning the 60 point reward in Rising Tensions Events. Ixalan cards are valid when viewing the available sets in any Standard event.